If you are fascinated by the world of aroma that the essential oils bring with them, but are not sure how to blend different essential oils and use them for their fragrance or therapeutic purposes, we give you a lowdown on the right way to blend essential oils in our guide to blending essential oils. In order to do that, the first thing that you need to be familiar with the effect and uses of each essential oil. This information is available widely on the internet and also along with the instruction leaflet that comes with all essential oils. First, find the purpose that you want to use the essential oil for, say, relief from pimples, or dandruff treatment or in general uplifting the mood. As per your requirement, find the best essential oil or oils to suit your need. For example, if acne relief is what you are looking for, then tea tree oil, sandalwood oil, lavender and lemongrass oils are your choices. How you combine them and in what percentages depends on their notes and categories. The kind of essential oil flavors that blend together depends on the notes and category that they belong to. Here are a few widely used categories. More information about these categories can be found on aromatherapy websites. Here is a gist of the essential oil categories. Next, they blend on the basis of their notes. 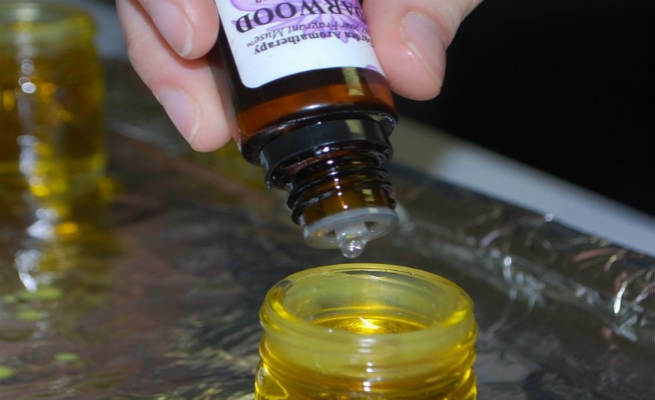 Essential oils differ in their viscosity and ability to evaporate. You apply a blend on your skin now and a couple of hours later, since one of them evaporates, the blend may start smelling different. Based on their viscosity and volatility, the essential oils are classified into top notes, middle notes and base notes. The lighter oils are called top notes. The heavier oils are called middle notes. The oils in between are called base notes. The ideal blend comprises of one essential oil from each note. But while picking the oils from each note, you should also consider the category that they belong to and whether the categories mixed together will be overpowering or gentle. For instance, lemon, neroli and ginger work great together as an energizing oil. Once you have picked the oils that you want to use, start with a dark glass bottle. Essential oils must be stored in a cool and dry place away from light in glass bottles. Take a dropper and start with a blend that has 10 drops of oil in the 50,30,20 ratio. 5 drops of middle note, 3 drops of top note and 2 drops of base note. Allow it to rest for two days. Smell it to see how the fragrance of the oil is. Now, to use this blend for a therapeutic massage, mix 4 drops of carrier oil with one drop of the blend. You can even apply the mixture on your pulse points to smell great through the day. Blending essential oils is an art that comes from some trial and error, but when you get there, you can create mind blowing blends that will wow not just you, but those around you too! A word of caution. These oils are extremely concentrated. So always dilute them with a carrier oil and use in small quantities and you are bound to thank the essential oils for all their goodness!